White, yellow and sometimes blue cereal attached to cobs that are covered by silk threads and fibrous leaves. Originating in North America, it was a primary food for many Native American tribes. Originally called maize, corn is found in three varieties: Grain corn, which is ground and used to make breads, tortillas, chips, cornflour and Bourbon. 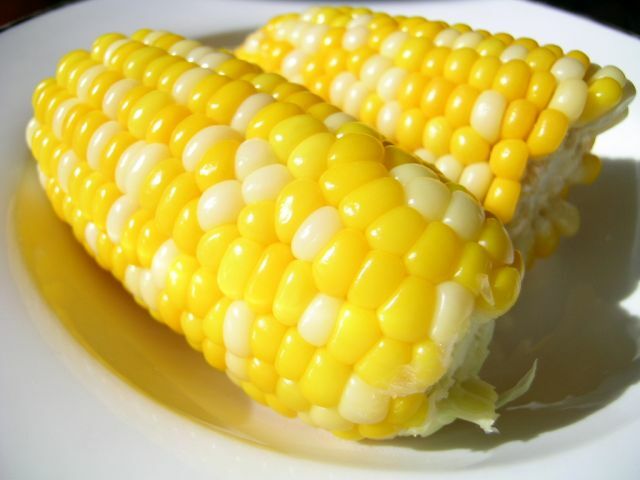 Sweetcorn, which is boiled or grilled and eaten directly off the cob. And popcorn, which is purchased in kernel form and heated until it literally pops -- it bursts into a puffy white mass and is coated in butter and salt for a snack or caramel for a dessert.